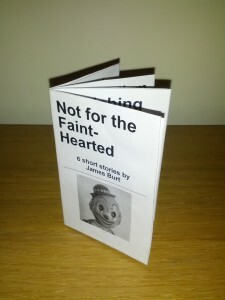 A first collection of short-stories by James Burt. It’s an A7-sized volume with 6 stories, totalling fewer than 600 words, written in the Not-For the Faint-Hearted workshop. Rosy Carrick said that it was “The best collection of stories I’ve ever read“, and you can trust her as she’s a doctor. Copies of this booklet are £1 including postage and packing. What are you waiting for?